Both businesses have leveraged their dominant core businesses (e-commerce for Amazon, and search for Google) to incubate new growth businesses such as Amazon Web Services (AWS) and Google's self-driving car venture Waymo, becoming much more modern-day conglomerates than single-business companies. While Amazon has outperformed over the past few years, which is the better home for your investment dollars today? Amazon vs. Google: Who wins? Image source: Getty Images. Data source: Alphabet annual report. Table by author. YOY=year over year. Google's advertising segment consists of its core search and YouTube properties, along with its network members, which are third-party sites that use Google's technology for in-page advertising. Google "Other" consists of Google's Cloud Platform, hardware, and app sales from the Google App store. Other Bets include Google's "moonshot" ventures, including Access (Broadband), Calico (anti-aging), CapitalG (late-stage venture capital), GV (early stage venture capital), Verily (health data technology), Waymo (self-driving cars), and X (secret, early-stage experimental research). As you can see, Google is still highly dependent on digital advertising, and likely will be for the foreseeable future; however, Google's Cloud segment is estimated to have grown 93.9% in 2018 according to Canalys Research, making up about one-third of the Google "Other" segment, or 5% of overall revenue. Cloud is one of the most attractive growth markets out there, so should momentum continue, Google Cloud could grow into a meaningful contributor in the years ahead. And while Google's "Other Bets" don't make much right now -- in fact, the unit had a $3.35 billion operating loss in 2018 -- some businesses could become big winners in five to ten years. For instance, one analyst believes that Waymo could one day be worth $175 billion. However, none of these segments generates meaningful revenue yet, so they still remain a little bit like lottery tickets to investors, offering a possible bonus on top of the company's strong core ad platform. Data source: Amazon annual report. Table by author. YOY=year over year. As you can see, Amazon is growing revenue a tad faster than Google, but that actually underestimates Amazon's profit growth potential. AWS, which grew revenue almost 47% last year, actually makes up a majority (58.7%) of Amazon's overall operating profits, despite only comprising 11% of revenue. The company's other higher-growth segments -- third-party sales, subscription sales, and "other" (which includes digital advertising) -- are also higher-margin businesses than the larger first-party online store. As these segments grow into more significant parts of the business, profits should outgrow revenue. Physical store growth above is distorted by the company's 2017 acquisition of Whole Foods. Like Google's "Other Bets," Amazon also has its sights set on disrupting more industries, such as healthcare and shipping; however, in contrast to Google's approach of spending heavily on technology moonshots that may not pay off, Amazon instead uses its scale to disrupt established industries from underneath, with lower prices and better service. We also get a mixed picture when we look at valuation and future growth prospects. 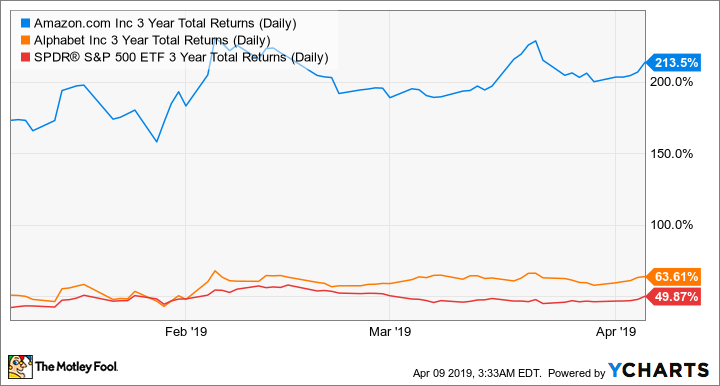 On the one hand, Google looks much cheaper than Amazon, with a forward PE ratio of 25.2 times 2019 earnings estimates, versus Amazon's 67.5 times forward earnings ratio. However, analysts also expect Amazon's earnings per share to skyrocket 60.8% annually over the next five years, compared to just 17.6% annual earnings growth for Alphabet. Making the choice even more difficult, each company is also looking to take on the other's most profitable business. Amazon has recently been winning market share in digital advertising from Google, though Google is still the undisputed digital ad leader. On the other hand, Google's Cloud Platform gained more market share than Amazon's leading AWS platform in 2018, though AWS also gained share against others. These developments in each company's core businesses are definitely worth monitoring. Both Amazon and Google are dominant tech players with outstanding management, and are good choices for your portfolio. I own both, though Amazon is a bigger position; I prefer Amazon's leading position in the cloud, as well as its open-ended growth opportunities to disrupt just about any existing industry -- including Google's digital advertising empire.